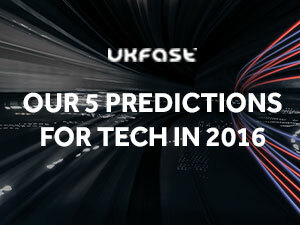 Last week we asked UKFast’s expert team what their IT Security and Cloud predictions for 2016 were. If you missed the webinar fear not – we also compiled them into a handy whitepaper for you. The whitepaper is a feast of information, covering their top five predictions, which range from the global threat landscape to software-defined networking. In this blog we’ll have a quick look at one of the predictions, which goes in-depth on some of the terms that we think will surface a lot this year. According to the team, the next year will be a ‘coming of age’ era for tech – things that have been waiting in the wings will start to come into their own and play a part in our daily lives and businesses. Don’t get left out of the watercooler banter – here are some of the things that will be talked about in 2016. First up is the ‘Device Mesh’ which refers to the network of devices that you use to access applications and information or interact with people, governments, social communities. It’s a pretty far-reaching term and can include anything from your phone and tablet, to wearables, to anything you’ve got hooked up to the Internet of Things (IoT). Coined by the tech gurus at Gartner, it’s this idea of all of the things coming together – especially with the rise of the IoT – and creating a big mesh of connectivity. Next we have Big Data going bigtime. Although BD has been a buzzword for a while it hasn’t been making a massive impression in the business world as yet. But apparently with the emergence of ‘sharding’ this is about to change. Sharding is the method of breaking down big databases into smaller ‘shards’, and storing these shards across multiple servers. This makes them more manageable and improves performance. It’s had a mixed reception in the past as the replications aren’t always exact, but as the process improves it’s becoming an increasingly attractive option. Finally the IoT is going to continue to grow. As we become more connected, more data will be available, which will ultimately let organisations tailor offerings more uniquely to customers, provided you’ve got an IT infrastructure that can cope with a hefty workload. 2016 is set to be a heck of a year for tech, and for the business uses of emerging technology. In order to make sure you’re ahead of the curve, it’s important to stay up to date with trends, and invest in the infrastructure that can support the technology that’s going to be making it big. Download our whitepaper for more predictions, information and expert advice.